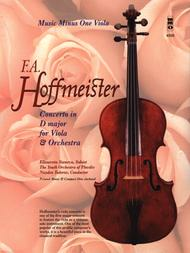 Hoffmeister's viola concerto is one of the first major concerti to feature the viola as a virtuoso solo instrument. One of the most popular of this prolific composer's works, it is a beautiful piece in the classical tradition. Includes a printed music score with informative liner notes; and a compact disc with the concerto performed first in stereo with the soloist, then again in Stereo minus you, the soloist. and than speeding up to get to the right temo. But more annoing is that you also get the pianissimos in the orchestra when it accomanies the solo art so you are not able to hear the orchestra when you play along, which defeats the purpose of music minus one. The cadenza in the first movement should have be omitted as well, it is not possible to finish at the same time as the soloist. The best thing you can say about it is the price which is really reasonable. Usable for study with mute, but not for any other purpose. The background CD music can be extremely hard to hear and follow along with even with a CD player's volume up really loud. Also, there are some inconsistencies with the sheet music and other publishers in the parts.